Morning breakfast this morning was more crowded than yesterday due to the arrival of large crowds of tour groups the night before. 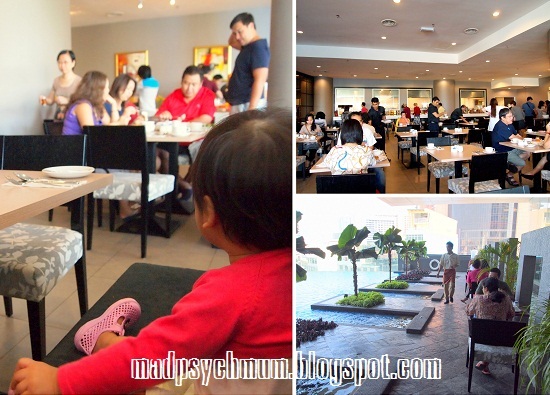 The good thing about eating here is that you can enjoy the beautiful view of the swimming pool. The bad part? The food was less appealing and there was less variety as compared to Berjaya Times Square. We checked out of our hotel rooms at 11.30am, bought some books for Girlee at Borders (at Berjaya Times Square) and ate lunch at Sweet Chat Cafe, which was famous for their curry laksa, tang yuan (glutinous balls) and durian pastry (sorry, forgot to take the pictures!). Yummy! Then it was off to Grassland Express' Super Nice Office to check in and board the bus bound for Singapore at 2pm.